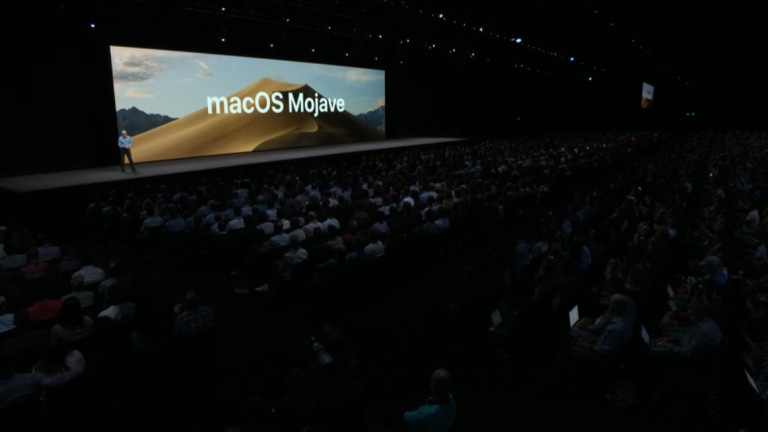 Apple has announced the next version of macOS will be called Mojave. The announcement was made at Apple's WWDC 2018 event and includes a series of new features that are exclusive to the OS. The macOS Mojave release date is scheduled for this fall, most likely in September or October, and as usual will be a free update. Here we'll run you through the key new features in macOS Mojave as well as giving you our first impression of their functionality and usefulness. During WWDC 2018 plenty of awesome functionality was also revealed for iPhone in the form of new iOS 12 features, so be sure to check out the 5 most awesome new iPhone features announced at Apple's Worldwide Developers Conference, too. The first of macOS Mojave's new features is Dark mode. This mode, once activated, turns the task bar, dock, folders and more aspects of the desktop to a dark grey colour. Aside from offering a gentler mode on the eye in low-light environments, this offers no additional functionality. It does look cool though. macOS Mojave also sees the Mac App Store getting a redesign, with the overall look and functionality becoming closer to the iOS store, which was redesigned last year. New apps are now more prominent, displayed on large signs, and Apple's own curated editorial content is also more prominent. The WWDC 2018 event also revealed that Microsoft is going to launch Office 365 in the new store, and the Adobe will launch Lightroom CC through it as well. Desktop stacks is Apple's new effort to help keep the macOS desktop clean for users. Stacks are essentially folders that are dedicated to certain file types, however, the different between stacks and folders is that stacks automatically collect files that should go into them. So, for example, if you have a image stack then when you drop it onto the desktop it will get swept up into it - click on the stack and the files launch back on the desktop for perusal. Apple has added extra layers of protection in macOS Mojave to help its users control what apps have access to personal information, as well as system information and details like location. In addition, Apple has extended its blocking of tracking from Safari to social networks. Essentially the changes make it harder for third parties to generate a "fingerprint" identity of you and your system and then track it across sites, manifesting itself with extra "allow" or "don't allow" options in terms of granting access. Group FaceTime is available in macOS Mojave, as well as in iOS 12, for the first time and allows up to 32 people to join a single video chat. Participants can be added at any time and users can even dial in via FaceTime audio from Apple Watch. A smaller update but seemingly very useful in daily usage scenarios, Apple has updated macOS Mojave's finder with "gallery view". This allows you to scroll through compact previews of files while also viewing key metadata inside the same finder window. Various quick actions can also be taken in gallery view, too, like photo rotation and PDF creation. Lastly, Apple has brought live wallpapers to macOS Mojave in the form of "Dynamic Desktop". One example was shown off at WWDC 2018 showing this in action a photo that as the day went on slowly changed from day to night. We're guessing a selection of these will be provided stock with macOS Mojave, however, whether or not will be able to create your own was unconfirmed.